You might be suprised to know that 50 year old class 37 diesels are hauling regular timetabled passenger services in 2015, but its true. How ths came about is a complex story. In the privatised railway, most of the trains are owned by companies who lease the rolling stock to the various operators such as Northern Rail, Great Western, TransPennine and Chiltern. TransPennine Express (TPE) leased a small number of modern class 170 diesel multiple units. When the lease for the units expired, TPE were only able to ask the leasing company for a short term lease, as their franchise term was getting near its end date. This was clearly unattractive to the leasing company. However, Chiltern Railways was in a position to lease them for a long period, so they got the 170s. This did mean that once the 170s moved south, TPE would not have enough trains to run its services, clearly a major problem. Eventually a complex deal was arranged to overcome the rolling stock shortage in the North of England. This saw services and stock transferred between TPE and Northern, plus two diagrams on the Cumbrian Coast line would be operated by DRS class 37s and coaches. The loco hauled sets are not used on Sundays. 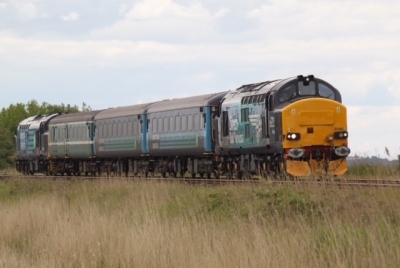 Below, once Driving Trailers were ready, a single class 37 was employed with the loco usually on the north end of the train. 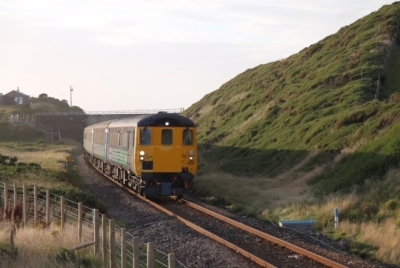 Few people know that the Cumbrian Coast line is one of the most scenic railway journeys in England, well worth a ride, even better behind a class 37. 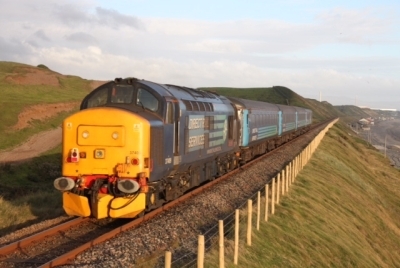 There is a very useful round robin ticket which enables you to travel between Lancaster and Carlisle via the Cumbrian Coast line, and return over Shap via the West Coast Mail Line. The journey can be made in either direction and starting from any station on the circle.